Tapping the potential of the changing workforce, consumer base, and citizenry requires a leadership approach that resonates with our country's growing diversity. 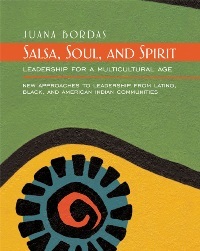 In Salsa, Soul, and Spirit, Juana Bordas shows how incorporating Latino, African American, and American Indian approaches to leadership into the mainstream has the potential to strengthen leadership practice and inspire today's ethnically rich workforce. Bordas identifies eight core leadership principles common to all three cultures, principles deeply rooted in each culture's values and developed under the most trying conditions. Using a lively blend of personal reflections, interviews with leaders from each community, historical background, and insightful analysis, she shows how these principles developed and illustrates the creative ways they've been put into practice in these communities as well as in some forward-looking companies. Bordas brings these principles together into a multicultural leadership model that offers a more flexible and inclusive way to lead and a new vision of the role of the leader in the organization. Multicultural leadership resonates with many cultures and encourages diverse people to actively engage, contribute, and tap their potential. In a globalized economy, success for leaders in the future will rest on their ability to shift to a multicultural approach. Salsa, Soul, and Spirit provides conceptual and practical guidelines for beginning that process.